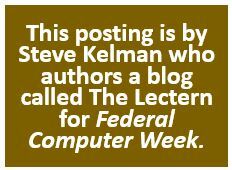 Steve Kelman’s recent talk with feds reinforced his view that a $10,000 micropurchase limit opens up vast new acquisition possibilities. Recently I did a webinar at the request of the General Services Administration’s Acquisition Gateway for professional services, as part of their Spotlight training series, on the new micropurchase threshold. As I have blogged before, the threshold has been raised to $10,000 for civilian agencies and, through a strange anomaly that hopefully will be corrected soon, to $6,000 for the Department of Defense. This change will allow agencies to make procurements of up to $10,000 without (if they choose) competitively soliciting or evaluating proposals, though some of the agencies that have started using the authority have chosen to develop one-page requirements statements and solicit one-page competitive proposal. Regulations implementing this change are unfortunately not out yet, but a number of agencies — including the Department of Veterans Affairs, the Department of Homeland Security and GSA itself — have received class deviations to introduce the change now. However, the GSA class deviation applies only to GSA’s own purchases, not more broadly for any purchases using GSA vehicles. The Department of Defense (DoD) has issued a class deviation that raises the micro-purchase threshold from $3,500 to $5,000. Class Deviation 2017-O0006, issued July 13, 2017 and effective immediately, allows authorized DoD buyers to make purchases of supplies and services up to $5,000 using streamlined procedures. Micro-purchases are primarily made through the use of Governmentwide purchase cards (GPC). According to FAR 13,203, micro-purchases may be awarded without soliciting competitive quotations if the contracting officer or other authorized official considers the price to be reasonable. The class deviation also raised the micro-purchase threshold to $10,000 for DoD’s basic research programs and for activities of DoD’s science and technology reinvention laboratories. 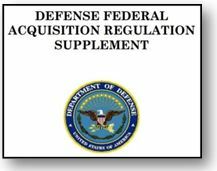 It is expected that these new purchasing thresholds will be incorporated into the Defense Federal Acquisition Regulation (DFARS) in the near future. J. Kirk McGill was a Senior Auditor at the Defense Contract Audit Agency (DCAA), the agency responsible for auditing the Department of Defense’s (DoD) contract expenditures. He is also a whistleblower whose disclosures to Congress have resulted in multiple Congressional hearings, the termination of a nonprofit from grants worth over $400 million, and the closure of a loophole in contracting policy for nonprofit grantees. Importantly, his case also sets a precedent for federal whistleblowers to engage in whistleblowing activities while on official time. None of this was easy, and it came—as is too often the case for whistleblowers—at a personal cost to McGill. When McGill examined the requirements of reporting suspected fraud in an audit report, he found himself trapped. The Defense Department had trouble determining reasonable prices for noncompetitive contracts because some contractors wouldn’t share pricing information, according to an Aug. 12 Government Accountability Office (GAO) report. Normally, DoD relies on competition to ensure that it pays a reasonable price for its goods and services. But for noncompetitive contracts, DoD relies on other methods including information from previous contracts or from the contractors themselves, GAO says in the report. The DoD requested pricing information from contractors for 12 of 32 noncompetitive agreements in GAO’s sample. For the remaning 20 contracts, DoD felt it already had enough information to make sure it was getting a reasonable price. The Navy and Marine Corps reasonably justified about $220 million worth of IT contracts that were solicited without full and open competition, says the Defense Department’s inspector general in a report issued Jan. 23. The IG reviewed 66 Navy and Marine Corps IT contracts that used “other than full and open competition” to procure technology services, with 34 being sole-source contracts and the other 32 limiting competition in some way. The 34 sole-source contracts were valued at $151.5 million, with the rest coming in around $70 million, the report says.